I grew up in two different very small towns in Gloucester County New Jersey. First, a very rural town called Barnsboro,where much of the land was woods or farm land, and then a few miles down, a very small town called Pitman. Within about 2 square miles, Pitman was a Methodist town with dozens of churches and a good number of families with children. By age 16 or 17, it became very apparent that my dad had to drive to the next town over, Glassboro, to buy himself beer. It was explained to me that Pitman is what’s known as a dry town,a town that has chose not to sell alcohol. As an underage kid who found a way to get my hands on cheap beer, I thought it was stupid, as they were missing out on revenue and making their eateries less attractive. My dad, who grew up in Pitman, thought it was dumb as well and told me as long as the ‘old blood’ still had their hands on the town, it was unlikely to change. Then all of a sudden, I see this new brewery called Kelly Green Brewing posting progress of opening their tasting room. Running The Full Pint means that I have hundreds of breweries on our Facebook timeline and Twitter. Then I saw it again, and noticed mention of Pitman, NJ. I couldn’t believe my eyes. 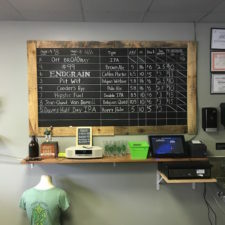 How the hell could dry Pitman, NJ have a small brewery in town? 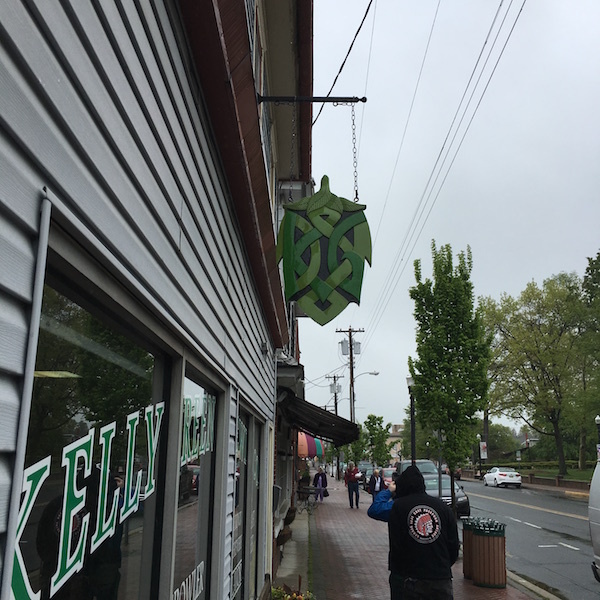 After investigating, the owners of Kelly Green found a loophole in New Jersey State law in regards to opening a small brewery, even if it’s in a dry town. Ok, so now I’m stoked, I post a supporting message on their Facebook post. Quickly, I get a reply from my good high school friend Justin Fleming, a guy that I haven’t talked to in almost 20 years, letting me know this is his and his wife Jeanette’s brewery. I couldn’t have been more happy for him and the little town of Pitman. 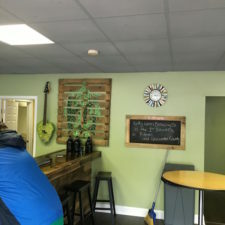 Because I was in town for the Craft Brewers Conference in Philadelphia last week, I contacted Justin to see if The Full Pint could get a sneak peak, the day before the grand opening. Knowing how small Pitman’s Broadway strip is, I was very cautious as far as what to expect from such a small brewhouse. 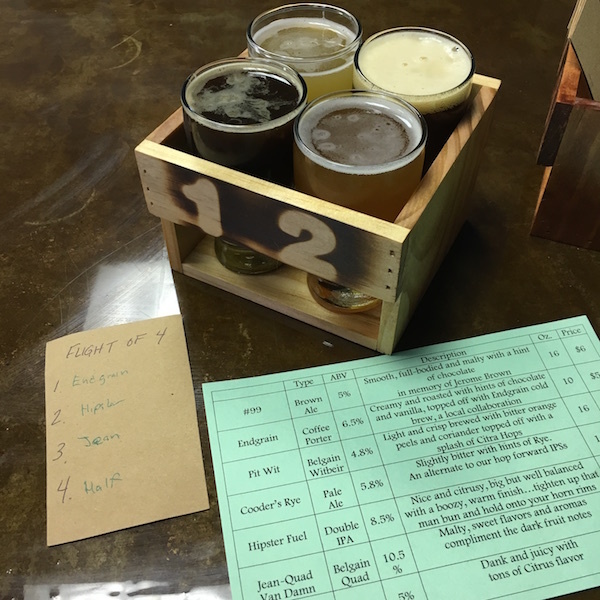 I rolled down with Jonny Fullpint and my family and entered in a very cozy tasting room. Justin’s wife Jeannette, who I also knew from highschool was always very artsy, and was the force behind the aesthetics of the tasting room. You could tell there was a lot of thought and love put into the tap handles, the tasting flight holders, the art on the walls and the color scheme. 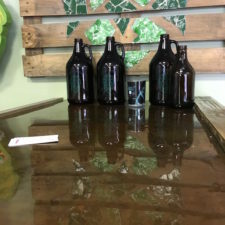 All that is well and good, but I’ve been to alot of nano breweries brewing on a 1bbl system, and quite frankly, most of them haven’t been talked about here on The Full Pint, because the beers needed a lot of work. I pulled up to the bar and ordered a flight of four beers. 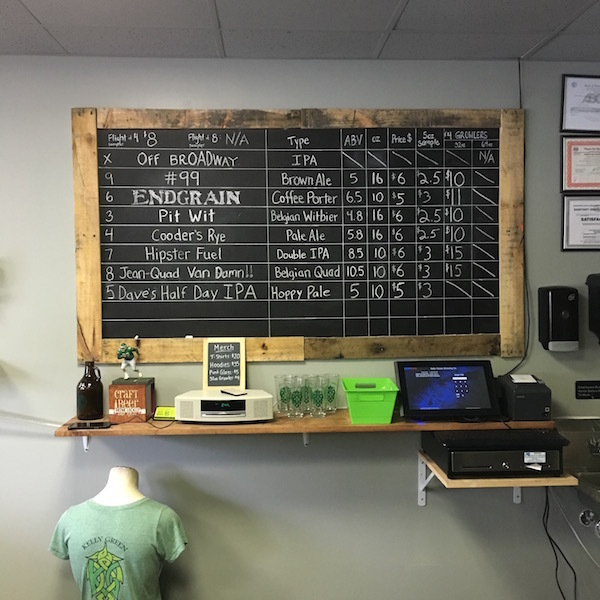 I started with Endgrain Coffee Porter, Hipster Fuel Double IPA, Jean-Quad Van Damn! Quad and Dave’s Half Day IPA, a session IPA. I’ll be damned if all four were not only passable, but were very tasty and well made. All had a bit of head and body, and all tasted as advertised. I also learned that Pitman not only has a new brewery, but a few shops down, a coffee roaster! I also have this preconceived notion about IPAs made in this region of the world, so I was stunned by how good the session and double IPA were. They were classic West-Coast styles, very clean and drinkable without gobs of malt that I had expected. I know, I have problems, but none the less, I was bursting with pride and joy for Justin and Jeanette, as well as the town of Pitman. We chopped it up with Justin and his buddies who were helping put the final touches on the place before the grand opening, and went on our way. 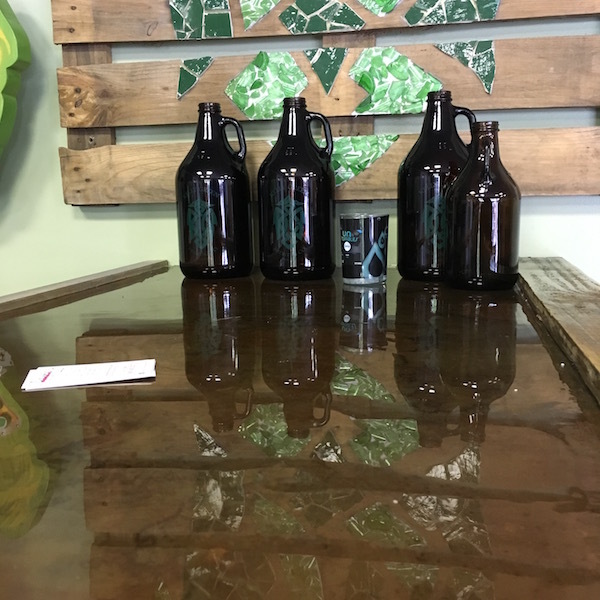 We asked Justin about long and short term plans, he replied: “in the short term, put out really good beer on our 1bbl system and create an awesome collection of beers, for the long term goal, expand to a bigger production facility with the ability to concentrate on small batches. 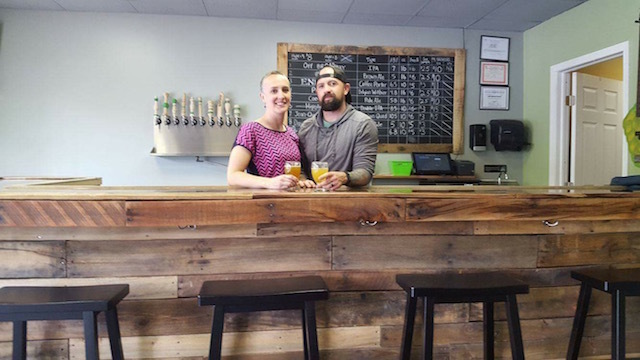 Pitman is our home and we want to grow in this town, it’s our roots.” I was curious to see if they would have any off-site accounts, and as you can imagine, we were told yes, but in extremely limited cases. 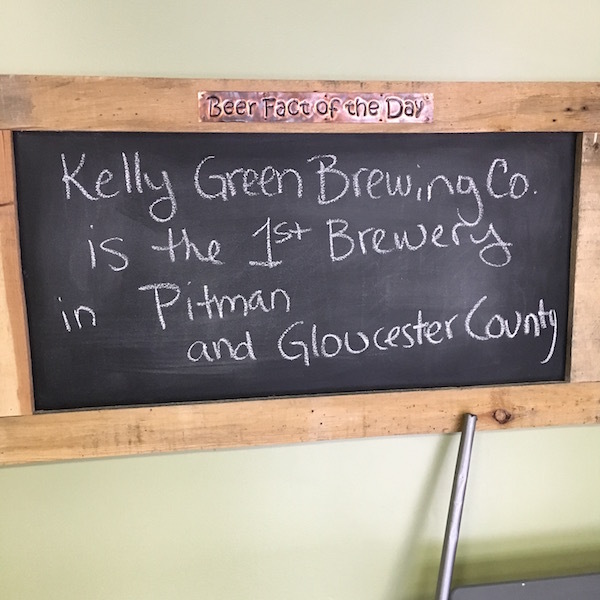 Pitman is a 20 minute car ride from Philadelphia, so if you are in the area, you should go down and support this history making brewery. 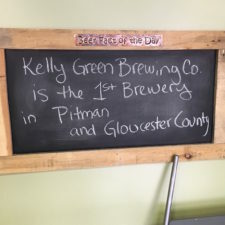 Follow Kelly Green Brewing on Facebook and Instagram. Good to see Barnsboro and Pitman getting back together. My father was born/raised in Pitman and my mother in Barnsboro, they’d both be as shocked as I was about the breweries. Glad Barnsboro got there first. Hope they do well! I just wish it was still called “downtown”. Uptown sounds too snobbish.